The rise of the internet and technology has drastically changed people's shopping patterns in recent decades, bringing forth such e-commerce titans as Alibaba and Amazon. They took advantage of the early stage of the internet back in the mid-to-late 1990s when disbelief was rampant about non face-to-face transactions. But as the internet became the new norm for any business activity, retailers at home and abroad began scrambling to create their own online and mobile shopping platforms. Korea was also one of the fastest-movers to accept the global paradigm shift in shopping, backed by its industry-wide efforts to build nationwide high-speed internet infrastructures. The internet, however, is no longer serving as a unique profit booster, as all but a few retailers invest in the platform and the internet is considered not an option, but the backbone for any business or other technologies. The arrival of a new era, converged with such big technological trends as the Internet of Things (IoT) and big data, is now offering more opportunities for existing retail players to diversify their revenue sources in a more intelligent way. 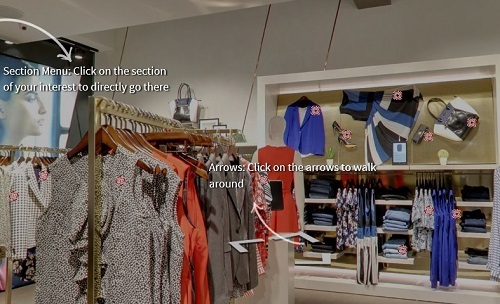 Preksh Innovations, an India-based startup specializing in shopping platform services converged with AR, also hopes to set a new standard in shopping, helping ease buying and selling experiences for both customers and retailers. AR is the combination of the real environment and computerized information, converging reality with simulated digital information. The market for AR and virtual reality (VR) is expected to significantly grow from $5.2 billion (6.76 trillion won) this year to more than $162 billion by 2020, according to market researcher IDC. "We have recently conducted a closed pilot test for a new shopping experience with a large department store chain," its co-founder Sathvik Muralidhar said in an interview, on Nov. 29. "Korea is a market with consumers who are very comfortable exploring new technologies," added the 29-year-old CEO who handles sales and strategic partnerships for the firm. He said Korea is also one of the best markets in the world for technology companies looking to find early-adopters for their products. "This, coupled with the fact that the internet infrastructure here is excellent, led us to Korea." The company is now actively signing partnerships with local technology and retail firms, conducting a series of pilot tests for its AR-converged shopping platforms. "We are now reaching out to a few large retailers here," he said. "Preksh Innovations is also in advanced discussions with one of the largest marketing agencies in Korea." He said the company, upon finalizing contracts with those local retail and marketing giants, will soon unveil their names in the coming few weeks, which he believes will help enhance the brand value of his company in Korea. AR has become the talk of the IT town here and abroad since AR-based mobile game Pokemon Go took the world by storm earlier this year. But no specific outcomes have yet to be generated for its actual applications for non-gaming industries here. With AR and VR gaining global traction, the Ministry of Science, ICT and Future Planning (MSIP) recently unveiled its plan to establish a special fund worth 40 billion won dedicated to strengthening the competitiveness of the country's two promising technologies. Preksh Innovations, for this reason, is seeking to become one of a few first movers with the technology in the Korean retail industry. The company, established in June 2015, is the world's first patented AR platform provider for retailers. "I am now convinced that there is tremendous potential for our technology here after spending about three months with all the stakeholders here," he said, hinting at the possibility that the firm will focus more on finding its channel partners here and raise more investment to set up a branch office. "In the long term, we intend to focus on creating technologies that will simplify the world for consumers and make experiences more intuitive. AR and VR technologies are a great way to bring back the elements of reality into the online world." He also expressed confidence over its global expansion, starting with Asian territories. "We hope to use Korea as a springboard to enter Japan and Southeast Asian markets in the coming years," he said.